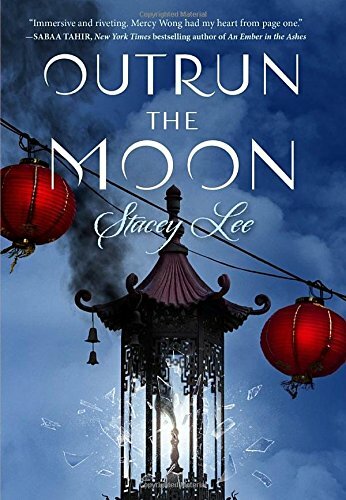 We're happy to welcome author Stacey Lee to CEFS as part of her blog tour in support of her new novel, Outrun the Moon. We loved her debut novel, Under a Painted Sky and can't wait to read this one too! I am going to share the story about the first time I saw Chinese people in a book. I had just learned to tie my shoelaces when I read THE FIVE CHINESE BROTHERS, by Claire Hutchet Bishop, illustrated by Kurt Wiese, G.P. Putnam’s Sons. I devoured the story, about a brother accused of murdering a young boy, who together with his four brothers and some inborn attributes like an iron neck, outwit an unjust legal system. But I didn’t just love it for the clever plot, I loved it because the brothers were Chinese. It was a revelation to see them, to have them be the heroes, and not just heroes, but superheroes! I dreamed about holding the sea in my mouth so I could treasure hunt at the bottom of the ocean. If I had super stretchy legs and resistance to extreme fire, I would be set for life. Growing up in a public school that had five Asian kids (and that included myself and my two sisters), simply seeing my people in a real book was a life changer, even if the story had nothing of personal relevance to me other than general themes of family and morality. I didn’t live in Ancient China like the brothers. I didn’t fish for a living. Looking back, of course I see the problems with this book. Though a respected illustrator, did Kurt Wiese have to make the Chinese brothers look so slanty-eyed and yellow skinned? Did he have to make all the villagers look exactly the same? Claire Hutchet Bishop was a beloved writer, but why weren’t Chinese authors getting their stories published? And why was the only Chinese book on the shelf a folk tale? Surely there were lots of stories written about Chinese people that take place outside Ancient China. But as a kid, all I knew is I loved it, and when I read it, it made me feel that all was right in the world. Not long after discovering that book, I won first place in the local library contest for my original bookmark that says, “Books Bring the Sunshine In.” I can’t be sure, but I suspect this book influenced the creation of this obvious masterpiece. When I write, I am always aware of the audience who will be reading my book. One of the concepts the We Need Diverse Books team uses when describing the importance of diverse books is that books should be both windows through which kids can learn about people who are different than them, as well as mirrors through they see themselves reflected. Diverse kids should know that they matter, just as majority kids need to learn that diverse kids are not just stereotypes. THE FIVE CHINESE BROTHERS is the only ‘mirror’ book from my early childhood that I remember, yet it inspired me to create an award-winning bookmark, and certainly shaped the writer I would become. What if I had never found it? Or more importantly, what if I had found hundreds like it (minus the stereotypes)? Perhaps I would be twice or thrice the writer I am today, with enough Newberry’s to make a pie, and enough Printzes to start a war. I couldn’t be more thrilled with the publication of my second historical featuring an Asian American girl, OUTRUN THE MOON (ironically from G.P. Putnam’s Sons, the same publisher of THE FIVE CHINESE BROTHERS). I dreamed big, because of one book. Stacey Lee is a fourth generation Californian with roots in San Francisco Chinatown. Born in Southern California, she graduated from UCLA then got her law degree at UC Davis King Hall. She has lots of experience with earthquakes, having skinned her knees more times than she wants to remember diving under tables. One day she hopes to own a hypoallergenic horse and live by the sea.